Granite countertops provide elegance to a kitchen unmatched by any other countertop surface on the market. A granite countertop offers natural beauty as well as everlasting durability. In addition, since granite countertops are a natural quarried product, they are available in an infinite amount of colors and shades. Granite kitchen countertops are also easy to maintain. Simply apply a granite sealer to them periodically to prevent the risk of stain and they will last forever. Though there are other high grade alternative countertop surfaces to choose from, such as Silestone countertops, Soapstone, and Corian countertops, all of them pale in comparison to the durability, low maintenance, and natural look of granite. Unlike Silestone countertops that are made from a composite of natural Quartz materials and synthetic resins, or Corian countertops that are made from acrylic polymers, granite countertops are 100% pure natural. As a result, they are virtually immune to heat damage. In addition, they are nearly impervious to staining, particularly if the granite countertops are sealed periodically. Granite countertops are also very competitive in price to Silestone and Corian countertops. Typically Silestone countertops are priced higher than most granite countertops, on a per square foot basis. Other lower cost alternatives to granite countertops include laminate and concrete countertops. Both laminate and concrete countertops can be fabricated to specific customer requirements and are available in a plethora of colors. But that said, they again pale in comparison to the elegant look of granite countertops. In addition, laminate countertops don’t hold a candle to the durability of granite. 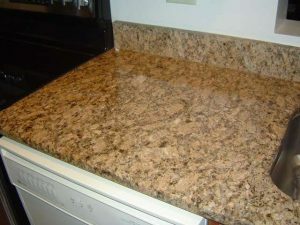 Granite countertops can be fabricated out of large sheets of granite, as well as cost competitive granite tiles. Moreover, granite countertop sheets are available in different thickness options to help mitigate high material and installation costs. As a result, there is a wide price range to support nearly every kitchen remodeling or construction budget. So before electing a lower cost kitchen countertop alternative, check with your local kitchen designer to see what granite countertop options might fit your kitchen remodeling or construction budget. For help on your kitchen remodeling project, see my Kitchen Remodeling Bid Sheet. The Kitchen Remodeling Bid Sheet provides a request for quote checklist section that you can provide to prospective kitchen remodeling contractors. It also includes a comprehensive kitchen remodeling cost breakdown table, in Microsoft Excel format, that allows the contractor to include his projected remodeling costs for every phase of the project.